KT Aims for 10K, Cookies are a Full Time Business! Michigan's Observer & Eccentric recently profiled Girl Scout KT HitesLareau, who hopes to sell ten-thousand boxes of cookies this season. Last year she sold 6,115 boxes of cookies, and netted a day at Michigan Adventure in Muskegon, along with other sales incentives. “My goal is 10,000 this year. It's my last year in Scouts and I want to go out with a bang. I want to sell as many as possible,” KT said. 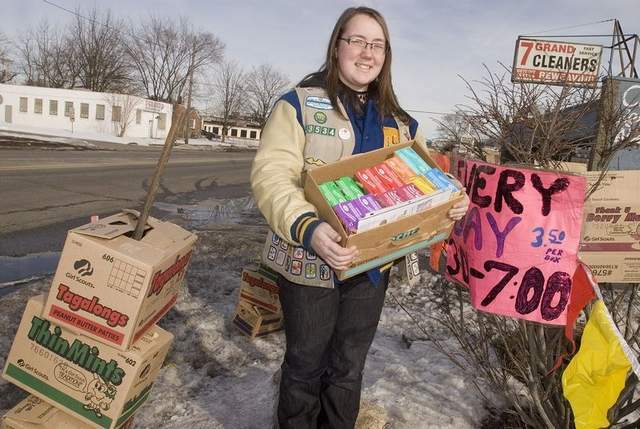 In Michigan, you can find her from 3-7 p.m. every day through March 20 just east of Beech Daly on Seven Mile in Redford peddling Tagalongs, Think Mints and Samoas. KT, who plans to study microbiology or another science at Michigan State University next year, says she inherited her sales ability from her mom and her knack for math and science from her dad, Roger. Good Luck KT! More on the business side of Girl Scout Cookies, Florida's Gainesville Sun reports that you will save half a buck a box buying your Thin Mints and Do-Si-Dos in Ocala compared to Gainesville and most areas around the country. Nationally, Girl Scouts sell about 200 million boxes of cookies every year at between $3 and $4 a box; this year, the West Central Florida Council overseeing Ocala units is charging $3.50 a box, but in Gainesville the cookies are $4 a box. "The local councils set the price," says Michelle Tompkins, spokeswoman for Girl Scouts of the USA, the national organization. "The councils know what works best for their communities; they know their markets."